Kadai Paneer is a delicious recipe made from paneer cooked in a tangy gravy made of onion, tomatoes, capsicum and authentic Indian spices. Kadai Paneer can be enjoyed with most Indian Breads like Phulka's, Tandoori Naan, Paratha etc as well as with Rice varieties like Jeera Rice or even plain rice. The looks of the dish are exotic and it's tastes yum !! This dish gets its name from Kadai, an Indian wok, which is essential for cooking Indian cuisines and used here to give smoky flavor to paneer (Indian cottage cheese). 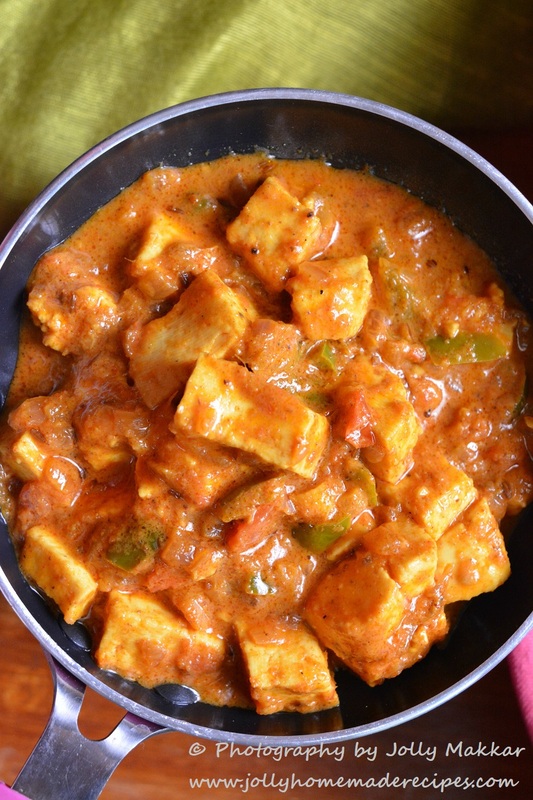 Kadai Paneer can be made in various ways. You can make a dry/semi-dry version for serving with breads. Paneer or Indian cottage cheese is a fresh cheese common in Indian subcontinent, and it is one of the most popular recipe in Indian cuisine. 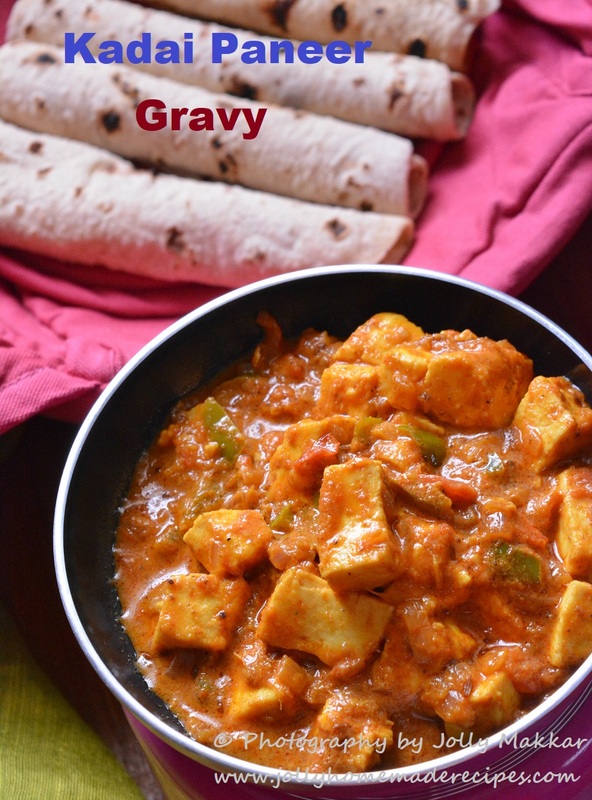 This delicious paneer recipe is a gravy version, it's easy to prepare and you can make it at times when you get unexpected guests, or you are not in mood to have daily dal-saabji :D for an elaborate cooking process. There is one more recipe of semi dry kadai paneer also which is already posted on my blog – restaurant style kadai paneer(dry version). The kadai paneer gravy is tangy and this comes from the tomatoes. if you prefer to the balance the tang, then add onions on base to balance the tanginess, which I have used in my gravy or you can add some cream towards the end(or avoid this step also) !! 1. Add all the paneer cubes to hot water and let it remain until ready to use. This gives the paneer a soft melt-in-mouth texture. 2. Dry roast all the ingredients of kadai masala in a pan on a low flame till aromatic. When the spices cool, grind them in a grinder to a semi fine powder and keep it aside. 1. In a pan, heat butter or oil or ghee. Then add the ginger-garlic paste and saute till their raw aroma disappears. 2. Add the chopped onions and saute till transparent. Add the grounded kadai masala that we made above also add green capsicum. Mix well. 3. Then add the finely chopped tomatoes and saute till the tomatoes become pulpy and you see oil releasing from the sides of the masala. 5. Add turmeric powder.....continue to saute till you see oil leaving the sides about 9 to 10 mins on a low flame. 6. Add water and salt....continue to simmer for some 7 to 8 minutes. 7. Later add crushed kasuri methi/dry fenugreek leaves, garam masala powder with sugar and stir. 8. Add the paneer cubes or slices. Stir gently, cook the paneer for about 1 to 2 minutes. 9. You can also 2 tbsp of cream toward the end. Just stir the cream gently in the gravy. 10. Garnish with chopped coriander leaves and serve kadai paneer gravy with roti's, tandoori butter naan, steamed rice or jeera rice. Thanks so much for this delicious! Pinning! most welcome and thanks for liking! Looking yummy yummy! Such a Beautiful dish..Thanks. This is just awesome. Love the way you have presented step by step recipe. Keep up the good work and look forward for more such interesting and intriguing recipes. 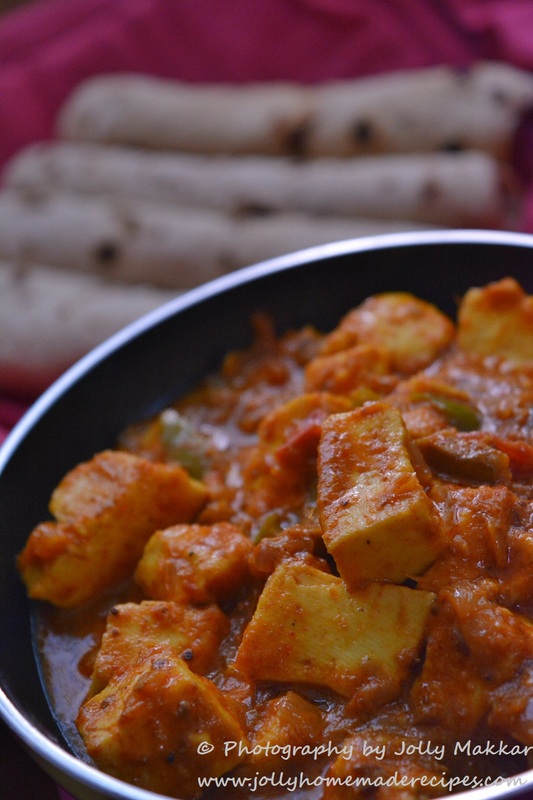 Delicious restaurant style kadai paneer. What an authentic recipe with layers of flavor and the gorgeous color! I like your tip about keeping the paneer in water as well. Fabulous share! 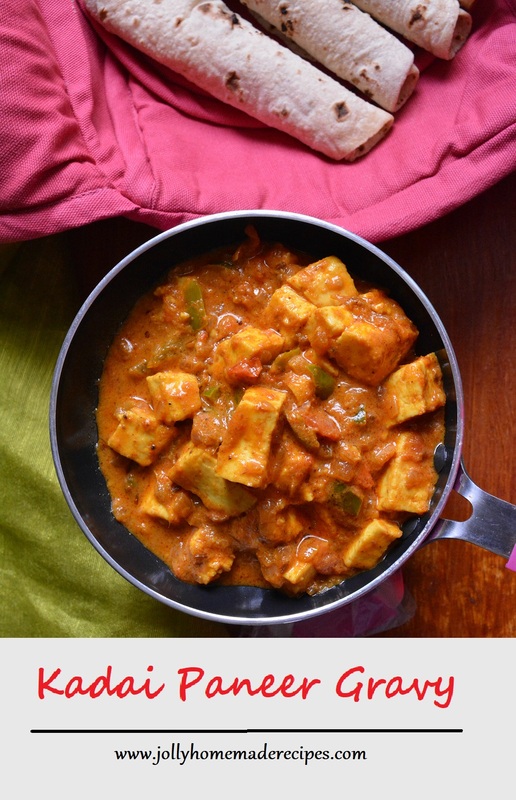 Absolutely irresistible, definitely a fingerlicking kadai paneer curry. My mouth is just watering here. What a fabulous dish. Awesome share Jolly. Kadai paneer looks mouthwatering. Loved the colour. Thanks for the well explained recipe. Kadai Paneer that looks so inviting that I want it now! Even I have started using cashews to lend body and creaminess to a dish. I am happy you gave the ingredients for the Kadai Masala separately because I can make other dishes with it as well. Give me a paneer dish any day of the week, anytime of the day and I'll be a very happy person! 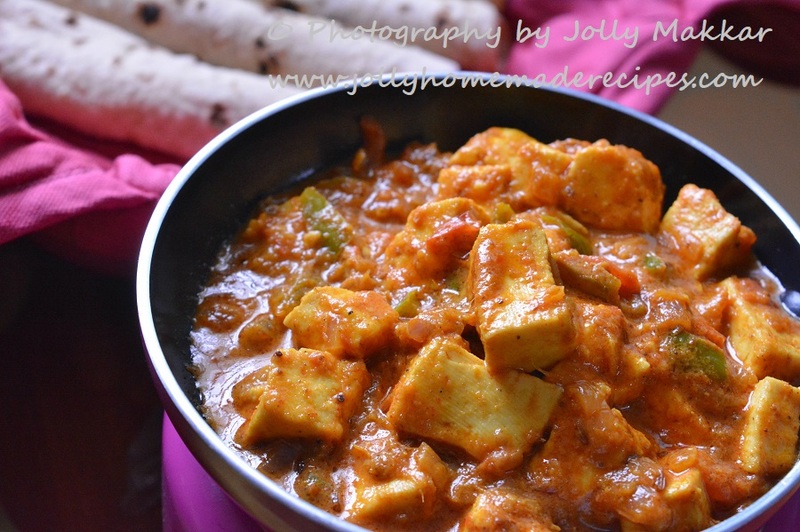 These masala soaked paneer chunks have my name written all over them, Jolly! I LOVE the picture with neatly rolled rotis on the side. What a Versatile and authentic dish! !....Pairs with anything and everything....Loved the detailed explanation of this fingerlicking all time favourite!! We are a paneer loving family, obviously;) Rich and creamy kadai paneer sounds so tempting and loving the colour of the dish. Looks so inviting and appetizing... Gravy color looks amazing ..
Kadai paneer gravy looks absolutely lip smacking and really looks just like restaurant ones. I am literally drooling over it and just need some naans to finish. What lovely looking dish, its an all time hit at my place. So so yumm !! Paneer is one of my favorite ingredients to cook a vegetarian dish. Kadai paneer looks fabulous. Kadai Paneer curry looks finger licking good. Paneer is a hot favorite with my boys. Fantastic share Jolly.